My first 5K is on Saturday. I currently cannot run two miles straight. It's actually debatable if I can even run a mile straight. The forecast for the next week up to the race (and including Saturday) is 90 degrees and humid which is when I feel like I can't run at all. Yesterday my ankle started bothering me which it has not done for months. 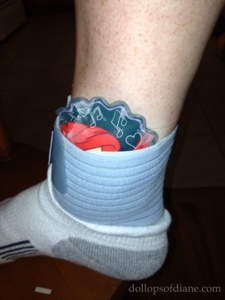 So I'm back from boot camp today and rocking an ankle brace with an Ariel ice pack. I'm trying not to feel too discouraged since I know that worst case I can just walk the 5K. I just hate it when a plan doesn't come together the way I want. Argh! BUT don't let my negative nelly-ness stop you from joining me on Saturday. You can find out all the race details HERE!